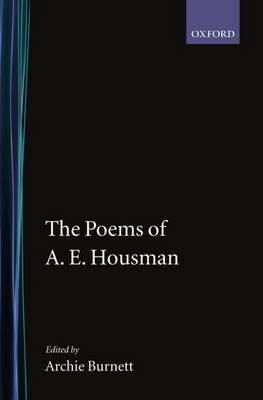 This is the first complete edition of A. E. Housman's poetry, unprecedented in the extent to which it reveals the shaping processes of his poetic thought. To the major poetry of The Collected Poems (1939) it adds a substantial body of light verse and juvenilia, some of it printed, or collected, for the first time; and it revises the texts - particularly the posthumously published poems and notebook fragments - in the light of a comprehensive survey of manuscript and printed sources, recording all textual variants. As well as charting his compositional practices, the edition illuminates the many sources, from Biblical and Classical to contemporary, which influenced Housman - consciously or unconsciously - in his choice of ideas, images, and phraseology. Drawing on the poet's two commonplace books, works he is known to have read, and volumes from his library, the editor's commentary traces the remarkable range of his echoes and allusions, which have never before been explored in such detail. The introduction and commentary also cover dating and other textual matters, information on persons, places, and historical context, and Housman's linguistic usage.